Congratulations to "Colleen C." and "Jo-Anne B. ", the winners in Dee's giveaway. Thank you to all who participated! I’m so glad to be back at JRS and I want to thank Maureen for having me! I’d also like everyone to take a second to send thoughts and prayers to the people of Nepal and all who just went through a devastating 7.8 earthquake. My heart is with those struggling in the aftermath of their loss. Elena and Bill thought you might like to hear their past earthquake stories. Bill: Elena, go ahead. Ladies first. Elena: Isn’t he sweet? Okay. So the Northridge quake in 1994 was our first experience. Julie and I had literally just moved to Los Angeles. She was eight. I mean, really, our timing couldn’t have been worse. It was almost enough to make us move out of state, but ultimately my sister, Vicki, convinced us to stay. And frankly, I had no desire to go back to Arizona. I didn’t want to be anywhere near my… Well, that doesn’t matter. Let me get to the story. Elena: Julie and I were staying with my sister in the valley. She had an extra room so Julie and I were sleeping together in bunk beds. There is nothing like being woken up out of a sound sleep to find the earth moving. Bill: Or everything, moving for that matter. Elena: Exactly. And it was like 4:20 in the morning. That’s just cruel. It was still pitch black outside and we couldn’t see a thing. I nearly went flying out of the top bunk. Thank God Julie wasn’t up there. She would’ve sailed across the room. I can tell you that was the fastest exit I had from that top bed. To be honest, I’m not even sure how I ended up below with Julie, but the two of us held tight in her bunk because the whole thing bounced across the room. All her books and toys tumbled off the shelf and the closet doors slammed against their tracks. Afterward, we huddled in the hallway because that was the core of the house with all the doorframes. We ate cereal from the box and listened to the news from a little transistor radio. Julie was just this tiny little thing and she was so much braver than me. She totally made fun of me because of the sound I made during the earthquake. Kind of a mix between a scream and a groan, but I just kept doing it. A nervous reaction, I guess. Bill: I remember you making that sound in the car. I wasn’t sure what it was. Then I got buried beneath a ton of dirt, so I was a little distracted. Elena: Tell them about your Northridge experience. Bill: I was still on my winter break from school and spending time at home. I remember the crazy noise and shaking. It seems never-ending when you’re in the middle of it. It feels like it’s lasting minutes when it’s usually only seconds. Elena: They are LONG seconds! Bill: Yep. I agree with that. Anyway, my bed did the same thing… it bounced across the room so I stayed put until the shaking ended. Then my parents showed up and collected my sisters and me and we camped in their room for a couple hours until the sun came up. Then my dad and I started clean up. We found a bowl that had been on top of the fridge actually in the refrigerator. The quake must have shook the door opened at the same time the bowl was falling, then the door closed and slammed the bowl inside. Oh, and the block of knives in the cutting board were buried in the wall in perfect order directly opposite the counter. The house was trashed. We lost just about everything in the kitchen. The walls were cracked. The foundation was cracked. It was a mess. Elena: I don’t know about you, but I’ve had my fill of earthquakes. Here that, big Guy? Done. Finito. No mas earthquakes. Bill: Zip-it-nope-don’t-want-to-hear-it. In case you haven’t read the story, here’s an excerpt of what we went through during this last earthquake. Another strange rolling sensation lifted the hair on her neck, and a split second later the increasing rumble roared in her ears until it sounded like a freight train around them. The limo bounced furiously as Elena’s heart nearly jumped into her throat. The oddest sound emerged from her mouth as the world bounced around her and she tried to steady herself in the seat. Is that what he’d yelled the first time? The noise deafened her as every hair stood on end and adrenaline raced in her system at warp speed. Something smashed on the roof and next to the limo and Elena dove to the floor as they lurched again. A thunderous crash blocked out everything and Elena screamed as the roof compressed and the windows shattered. She waited to be crushed, waited for the pain that came with serious injury. Or death. The shaking continued. Seemed to go on forever until it finally, mercifully, stopped. Curled up into a ball on the limo floor, Elena lifted her arms from over her head and blinked at the hazy air in the limo. “B—” She sucked in a mouth full of dust and coughed it out. “Bill?” she croaked. When he didn’t answer, her heart stuttered for a different reason. Oh God. “Bill!” She called louder and moved toward the front seat. She could barely see a stupid thing, but she could taste the grit in the air. The silence scared her as much as the noise had a couple of minutes ago. Glass pricked her sweaty palms and bit into her knees as she crawled forward. Her hands hit a wall of dirt. Dirt? That didn’t make sense. God, she needed her eyes to adjust to the dark! She remembered the small pen light in her purse for emergencies and rushed back to find it. She dumped the contents of her bag on the seat and felt around for it. There! She pressed the end and blinked into the dusty interior. The mound of dirt coming from the front of the limo didn’t make sense. Unless the truck in front of them lost his load and the limo had been close enough to be buried by it. Oh god!! Bill was up there. Buried! Bill: Was that a play on the title? Cute. Elena: Stop distracting me. You know how I get when you smile at me like that. Bill: I do. I definitely do. We were about done here, right? I think we have someplace to be. Elena: We do? Did I forget something? Bill! You are so bad! Thanks for having us today. We had a great time! In case you’d like to know one of Dee J.’s earthquake stories, you can hop over to her blog. She’s sharing the 5.5 she experienced while working on set at Roseanne. Hope you enjoy it… and A Little Danger! 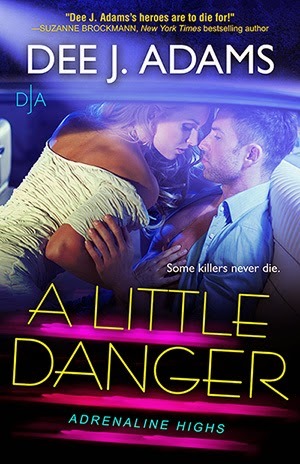 Dee will be giving away 2 digital copies of A LITTLE DANGER to two lucky commenters or email entrants! Thank you for sharing. I hope never to experience an earthquake. Before I was ever in one, my uncle said, "Everyone should experience an earthquake once in their life." I don't know that I ever agreed with him! They do make you glad to be alive when they're over! congrats to Dee on the new release!!! *shudders* that's one of my worst nightmares!!! I'm so glad that I don't live in an area where's it's an issue. Thanks for sharing! Thank you! A small earthquake is a little exciting. They don't bother me if there's no damage. But yeah, the big ones stink! Thanks for dropping by! Oh I enjoy your books... that for sharing a bit about A LITTLE DANGER! Thanks for telling us about your book. I like the sound of A Little Danger and the 'villian' being an earthquake. Thanks for the giveaway. I sure hope I win. Glad it sounds interesting. Good luck!